Russell Stannard, winner of the British Council Innovations Award 2010 and owner of teachertrainingvideos.com returns with another useful web tool for language teachers and learners. This time it’s a website that enables you to create your own illustrated stories. I dedicate half my life to looking for interesting websites for language learning. Just like London buses, the good websites all seem to come along at the same time. The last few months have been amazing but I think there is one site that really stands out. The website in question is Storybird.com. In its simplest form it is a website that allows you to create short illustrated stories or books. There is nothing much new about that, but the actual tools and illustrations that the site provides are what make it stand out from anything similar I have seen. 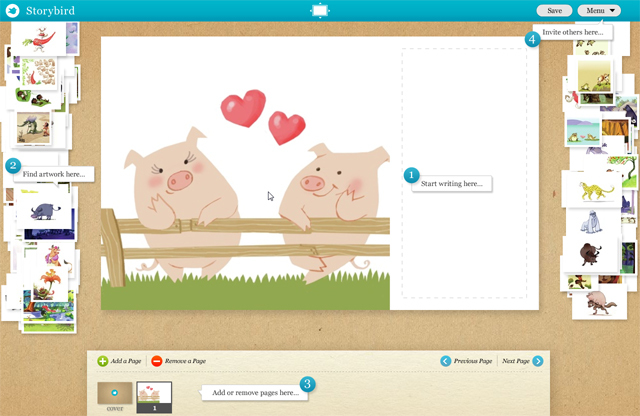 Storybird provides whole collections of artwork around a theme or topic. The artwork is by amazing artists and the collections are linked. So all the pictures have the same ‘look and feel’ and can be easily fitted together to create a very professional looking story. A student can visit the site, choose a certain artist or topic and then use the pictures to build up a story. The student can build up his/her story by dragging pictures they like into the centre of their screen and then writing the story in the space provided. The artwork is simply breath-taking and the tools allow the students to easily add pages, add and delete pictures and edit the text. The resulting books can then be saved on the website for others to read or for the teacher to view. What’s more, the whole site is free! The stories can also be printed out and a cover is even provided. Writing stories is not for all students. The key, in my opinion, is to give students help with the writing process. So, for example, if you are going to get the students to write a story around the theme of “parks”, you might start by thinking of a series of exercises you could do to get them to brainstorm and focus on ideas. It might include listing related vocabulary, putting students into pairs and giving them an image of a park to describe together. You might provide the students with a list of activities and ask them which ones they would do in a park. The idea is to get them thinking about the topic, building up their vocabulary and generating ideas. If you don’t think your students are interested in writing stories then use the site as a reading tool. Provide students with the story and tell them to go onto Storybird.com and find pictures to go with the story. They can select their own pictures and then add in the story you provided. This way they have to read the story carefully and choose the pictures that work with it. The site can work with any level of student. It could be a simple book of pictures and short and simple descriptions or even an illustrated dictionary. It could be as complex as a complete story that uses the illustrations to add a visual element. The site works great on an interactive whiteboard. The pictures are bright and colourful and superbly illustrated. Students could work in groups and write a story collaboratively and you could allow each group to come to the board and add the next picture. The possibilities are endless. Of course you can simply use Storybird as a source of reading material; there are some amazing stories on the site and, of course, the illustrations are marvellous. Russell Stannard runs www.teachertrainingvideos.com which helps teachers to incorporate ICT into their language teaching. The site won the British Council ELTons Award for Innovation 2010, the TEFL.net Site of the Year 2009 and The Times Higher Outstanding Initiative in ICT 2008. Russell is a Principal Teaching Fellow at the University of Warwick where he teaches the technology course on the ELT MA. Categories: Multimedia & Digital, Professional Development | Tags: Advice, EdTech, ELT, ICT, Illustrations, Russell Stannard, Storybird.com, Storytelling, Teacher Development, Technology, Web tools, Websites | Permalink. Thank you for sharing this website. It is brilliant. The potential to get students to write creatively is amazing. Again, thank you for sharing this. I am going to be putting a link to Storybird on my blog. Thank you for writing about Storybird.com. The site is really amazing, a great way to practice creativity and have fun.